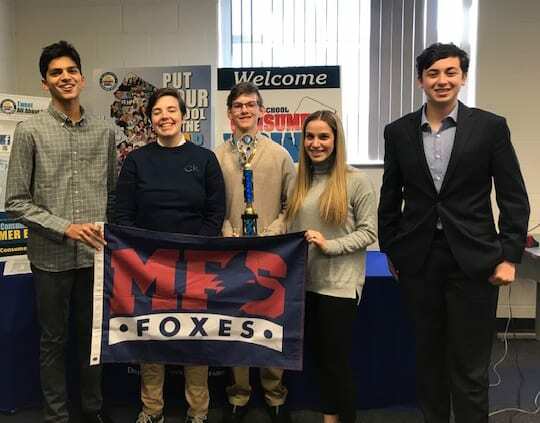 The Upper School Consumer Bowl team captured first place in the Burlington County Consumer Bowl competition, held February 4 at Burlington County Emergency Services Training Center in Westampton. The team advances to the Southern New Jersey Regional Consumer Bowl competition on April 12 in Clayton. Team members (pictured from left) are: Jalen Patel ’20, Bailey Butterworth ’20, Zachary Fox ’20, Mariana Goldlust ’19, and Joshua Strauss ’20. The advisor is History Teacher Jackie Scully. The New Jersey High School Consumer Bowl is a quiz-show style competition in which students test their knowledge on consumer affairs. The competitors are asked a host of questions on issues affecting buyers of goods and services, such as Ponzi schemes, investment fraud, and insurance policies. The competition is sponsored by the New Jersey Division of Consumer Affairs.